This composition, by the artist Sunlal Ratna Tamang, depicts the assembly of the Twenty-one Taras according to the tradition of the great Nyingma scholar and Dzogchen master Longchen Rabjampa (1308-63), who is commonly known as Longchenpa. There are three principal traditions in which the Twenty-one Taras are depicted. The first is that of the Indian master Suryagupta (circa 700 A.D.), where each of the Twenty-one Taras are completely different in form, posture, colour, and the number of heads, hands, and the attributes that they hold. The second is the tradition of Nagarjuna and Atisha, where the forms of the Twenty-one Taras all appear in the familiar aspect of Green Tara, holding a blue lotus in their left hands, and a specific coloured vase or flask in their right hands: but they each have different skin colours, and several have distinct facial expressions. In the third tradition instigated by Longchenpa all of the Twenty-one Taras are likewise depicted in the conventional form of Green Tara. Each one sits in ardha-paryanka posture with her right leg slightly extended, her lowered right hand making the boon-granting varada-mudra, and her left hand holding the stem of an immaculate blue lotus before her heart. With the exception of green Khadiravana Tara at the centre, each of the smaller surrounding Tara’s has a specific colour and attribute, with the attribute resting upon the open lotus that she holds in her left hand. All of these Taras have two eyes, but their expressions may be classified as peaceful, slightly wrathful, or wrathful and frowning. Their colours are predominantly white, yellow, red, and dark red or black, which essentially correspond to the four tantric activities of pacifying (white), enriching (yellow), subjugating (red), and wrathful activity (black). The green colour of the central or main deity, Khadiravani Tara (1), represents her all-purpose activity and her association with the green element of wind or air. The sequence of the twenty smaller Taras that surround the central figure of green Khadiravani Tara begins with Turavira Tara (2), who appears second from the left in the second row from the bottom. The sequence then circles clockwise around the central figure (2 to 15) until it ends with white Prasanti Tara (15), who appears next to Turavira Tara (2) and third from the left in the second row. The sequence then follows an outer clockwise circle that encompasses the last six Taras (16 to 21), beginning with pale-red Ujjvaladyuti Tara (16), who appears to the left of centre in the bottom row. Then orange Amitaparkrama Tara (17) at the bottom left corner; white Mahamayuri Tara (18) near the top left corner; white Ajitarani Tara (19) near the top right corner; orange Savari Tara (20) in the bottom left corner; and finally pink Marici Tara (21), who appears to the right of centre in the bottom row. At the top of the painting are blue Akshobhya Buddha (left), white four-armed Avalokiteshvara (centre), and white Vajrasattva (right). 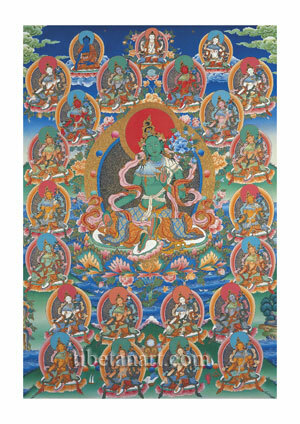 A brief description of each of the Twenty-one Taras are given on the back of this print, which includes the meaning of their Sanskrit and Tibetan names, their colours and attributes, and the activities they perform.